MEOUG MAJLIS is the only platform in Middle East, for Oracle Users to Learn & Share. As an End User forum, MEOUG MAJLIS 2017 benefits users of entire stack of Oracle products to gain better value from their Oracle investments. Develop your network of contacts by interacting with Oracle customers, System Integrators, Consultants, developers and representatives from Oracle Corporation. 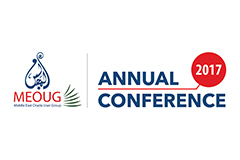 Middle East Oracle User Group (MEOUG) an Independent User Group, will hold its Annual Conference - MAJLIS 2017 in Dubai. An exciting day of Oracle Roadmap, User Case Studies, SIG meetings and Round table. Attendees are expected from Middle East, Asia, US, UK & Europe. Take advantage of the in-depth technology offerings covering Oracle Cloud Applicatons, Cloud Infrastructure, Cloud Platform Services, E-Business Suite and many more. Connect with over 500+ Oracle technology users. Join MEOUG and MAJLIS 2017 to Connect, Communicate & Collaborate how innovation can be achieved without complexity. Come learn from the experts how to simplify your IT investment by putting the latest technologies into practice to drive your business performance. Membership Duration: Valid for 1 year from start date of the membership, to be renewed every year. Applaud are an Oracle Gold Partner who offer phone, tablet and desktop apps for Oracle E-Business Suite. Built in the latest HTML5 technology, Applaud's solutions are validated by Oracle and offer enhanced usability and mobile access to common end user processes along with a comprehensive toolkit that allows technical teams to build their own apps. Solutions include the award-winning GL Wand for financial reporting, Reports Wand for sub-ledger and operational reporting, Budget Wand for budget loading and Journal Wand for uploading actuals. Oracle Skins is part of Appsynx - the only Oracle Partner dedicated to User Interface (UI) and User Experience (UX) solutions. We help to improve employee buy-in and user adoption by creating individually designed skins for E-Business Suite, Business Intelligence (OBIEE), and Fusion. Our latest "Touch" skins now bring all your EBS functionality to mobile devices without any additional technology. Inspirage is an integrated supply chain specialist firm solving business critical challenges from design to delivery. The company delivers end-to-end consulting and implementation solutions that link Innovation Management, Supply Chain Management and Logistics Management. Inspirage is a Oracle Cloud Premier Platinum level member and has been recognized by Oracle with numerous awards. Headquartered in Bellevue, Washington, the company has global presence with offices in North America, Europe, and Asia. Over the past 7 years, TransSys has worked with 125+ customers in 30 countries and has in the process established a leadership position by delivering 140+ Oracle Cloud engagements in the ECEMEA region. Its proven experience and deep expertise in all areas of Oracle E-Business Suite, Oracle Cloud Applications, and Fusion Middleware has helped established one of the largest client reference base for Oracle Applications. TransSys is known for its functional and technical expertise across industries and business functions viz. for Financials, Projects, Manufacturing, Supply Chain, Human Capital Management, and Customer Relationship Management. Polaris Associates offers Self Service Reporting and BI Solutions to companies of all sizes. Reporting Workbench, is a self-service Operational Reporting Tool and Discoverer Replacement embedded in Oracle E-Business Suite. ORBIT Analytics is an easy to use Operational Reporting and Business Intelligence solution that enables end users to develop their own analytics from multiple data sources. ProAssert, with Head office in Dubai and multiple branches across India, is a fast growing HR services company helping clients achieve their business goals. Serving customers from StartUps to Fortune 500 across the globe, ProAssert’s team consists of some of the best HR consultants in the Industry, with strong domain knowledge. Our success is attributed to our search professionals, methodology, superior relationships, and an unrelenting focus towards quality and high end research, Shaping the world of work. Cloud Test Drive : PaaS and IaaS hands-on A hands-on event to explore Oracle’s new cloud services. No expertise required! About Times are changing and things are getting simpler in the Cloud! At Oracle we have invested in delivering a plethora of new Cloud Services and we want to show you how simple – yet powerful they are. We want to showcase how simple they are for the IT and for the non-IT alike - and how powerful they are to be considered as serious tools that could help your organization take the right steps in transforming for the Digital era. We believe the best way to do this is to let you explore our cloud services, hands-on! We have prepared an event were will give you access to a number of Oracle Cloud Services and have our experts guide you to “play around” with our tools and browse the screens, configure integrations, processes or develop applications. No expertise or experience required This is not a training event and we will not make our audience go through complex scenarios. Instead, this will be simple, hands-on to help everyone understand what each service is and how it could fit in a modern, hybrid IT ecosystem. We will have experienced instructors guide you through the tool’s online screens and explain how each service works. There is no expertise required from your side. What to bring A laptop with a web browser. In this session, hear from Oracle E-Business Suite General Manager Cliff Godwin as he delivers an update on the Oracle E-Business Suite product line. Cliff will also discuss how many of the industry trends such as Subscription Economy, Industry 4.0, Big Data, IoT, Mobile and the Oracle Cloud are being adopted by E-Business Suite today and the future. You will come away with an understanding of the value Oracle E-Business Suite applications deliver now and in the future. Ebrahim K Kanoo B.S.C. (EKK), a sole automotive distributor of Toyota and Lexus has implemented Oracle e-Business Suite across all its business units. EKK also initiated a Business Intelligence project and went live with its first phase. With GCC decision to implement VAT across all the countries effective Jan 1, 2018, it is absolutely necessary to configure and tune your system to VAT before the due date, so that system calculates input and out taxes, keeps the record of tax paid and due with all allowed exceptions. In this session we will touch briefly about tax feature and its implementation. Come and learn about the tremendous business value that the Internet of Things, big data, and machine learning can add to your Oracle E-Business Suite implementation. Asset monitoring, predictions and insights will enhance the user experience and further automate and digitize business processes. Oracle E-Business Suite Information Discovery brings creative features to EBS by adding advanced search capabilities, showing data in modern visualizations and exposing business insights. Productivity increases by enabling users to take advantage of the accumulated wisdom in the system to make better decisions. This session covers innovations and new features of the latest release. It also covers feedback from customers, a simplified licensing update and Cloud support. As the pace of cloud adoption accelerates, enterprises must leverage current IT investments and simultaneously innovate for the future. Join this session to see new capabilities of Oracle Cloud Platform: PaaS & IaaS. • Oracle Platform as a Service (PaaS) helps enterprise IT and independent software vendor (ISV) developers rapidly build and deploy rich applications - or extend Oracle Cloud SaaS apps - using an enterprise-grade cloud platform based on the industry's #1 database and application server. • Oracle Infrastructure as a Service (IaaS) offers a comprehensive set of integrated, subscription-based infrastructure services that enable businesses to run any workload in an enterprise-grade cloud managed, hosted, and supported by Oracle. RC can be referred to the critical capabilities that must work together to achieve Principled Performance. GRC integrate the governance, management and assurance of performance, risk, and compliance activities. It covers the following departments - internal audit, compliance, risk, legal, finance, IT, HR as well as the lines of business, executive suite and the board itself. Have user adoption challenges thwarted your efforts to realise your original business case for Oracle E-Business Suite? You're not alone. The #1 driver of change in HR systems comes from the need for a more compelling, consumer-like, experience for managers and employees. In this short presentation, Applaud will introduce you to their solutions that improve the usability of Oracle and are complimented by mobile apps which extend the reach of your system to outside the office. We will show you why implementing Applaud can be a quick win that can turn around your users' perception of Oracle within weeks. In this session, representatives from Oracle E-Business Suite HCM Development Executive management will share their vision, key focus areas and roadmap for the product line. They will also highlight key new features and capabilities added to Release 12.2.6. As the information age has progressed, individuals and organisations have become accustomed to having everything at their fingertips, easily and instantly. Financial and operational information from Oracle EBS currently lacks this immediacy, significantly hampered by legacy systems, processes and complex BI solutions with an inability to easily access vital information in the desired format and in a timely manner. The benefit of implementing solutions that provide this instant access are significant, with efficient and effective reporting, rapid decision making, and the establishment of an agile accounting function and broader organisational capability. Hear Michael Bonito from Excel4apps as he shares his thoughts and experiences from dealing with organisations who have successfully incorporated Continuous Accounting solutions and processes.